Rails 3.1 is almost here, and all the rock star ninja hipster early adopters have been playing with it for a while. I’m not a ninja (picture me with a black tight skin suit if you wonder why), so I didn’t install it until today. Installation is pretty straight forward, but there are a couple of tricks, so here they are in full Technicolor to save you a couple of minutes. If you are on windows and don’t have rvm, maybe you could install another version of ruby via pik, but I cannot help you with that. You know the rest of the song.. Now go to http://localhost:3000 and start dancing! 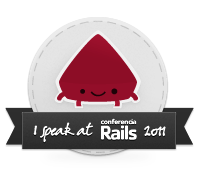 This entry was posted on June 30, 2011 at 3:28 pm	and is filed under development, javier ramirez, ruby, ruby on rails. Tagged: 3.1.0.rc4, rails 3.1.0.rc4, rails31. You can follow any responses to this entry through the RSS 2.0 feed. You can leave a response, or trackback from your own site. Wow! Pretty useful tools! I’ve just try out Rails 3.1. Hope you share info very helpful install this tools. Thanks mate! Your head is smaller than Michael Dudikoff’s. But here you go.